Dear reader, I must apologize that I am not that hip or current into popular culture. My daughter will tell you that. 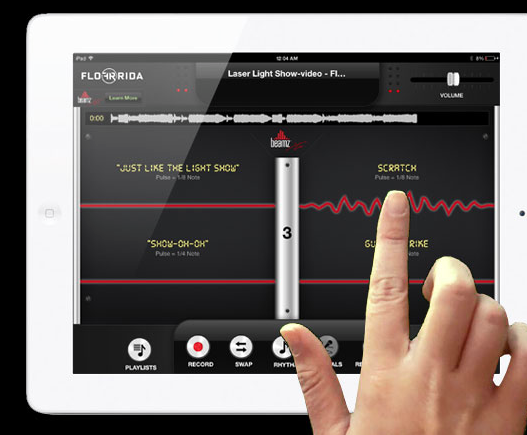 The Beamz by Flo app is not just a beat maker, sampler player, nor is it a music production app like Garage Band requiring a deep commitment of time and understanding of music. Based on Beamz’ exclusive interactive music format, Beamz by Flo offers users hours of fun playing, creating, listening, recording and sharing their own version of their favorite songs with their friends. Clearly, I am not the target audience for this app, but I decided to give it a try. Who knows, I may find the inner rapper, mixer, sampler, DJ, or whatever inside…but I think it something my daughter may enjoy more. At first, I had a little trouble mixing my own version, but I have to admit I was walking the dogs and multitasking. The help menu is super simple to follow, and before you know it, I had a version of [amazon_link id=”B0013DA95O” target=”_blank” ]Billie Jean [/amazon_link]better than the original 🙂 It only took about five minutes to figure it out. The Beamz by Flo application is an interactive music application that allows you to experience making music and getting creative with music unlike any other music application. Interactive songs are made for anyone to jump in and play, regardless of experience, and it’s all setup to sound great no matter how you choose to play. In each song there are three pages of instruments, sound effects and/or vocals to add into the playback of a master track – and you can record your creative mixes to share with your friends. I definitely see the potential here for creativity! I wish there was a way to add music that you already own instead of purchasing new music for playlists. Maybe there is, and I haven’t figured it out. There is nothing green about this product. Just saying…but sometimes we write reviews outside our niche.